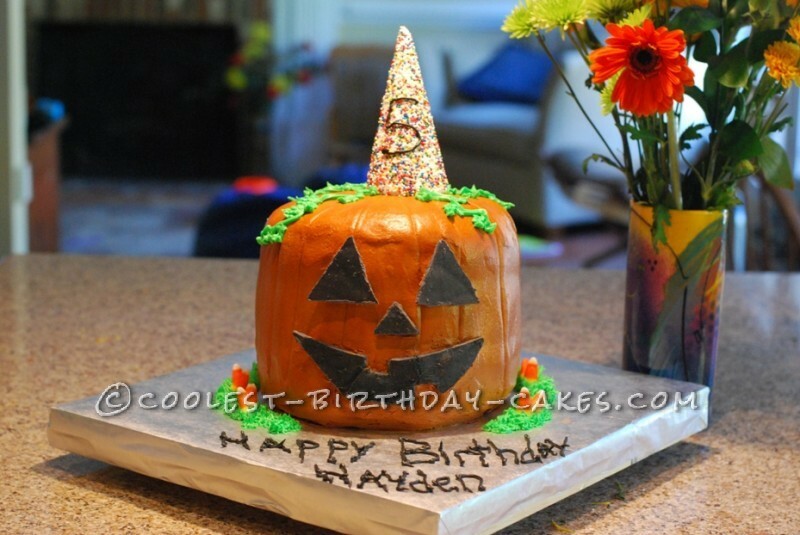 A pumpkin seemed the perfect cake for a 5 yr old’s birthday party just before Halloween. I used two bundt cake pans and then a third 9 in. round. I stacked one bundt upside down then the 9 in. round on top of that then the second bundt cake right side up for the top. All the cakes were yellow cake box mixes. I spread vanilla pudding in between the three cakes. 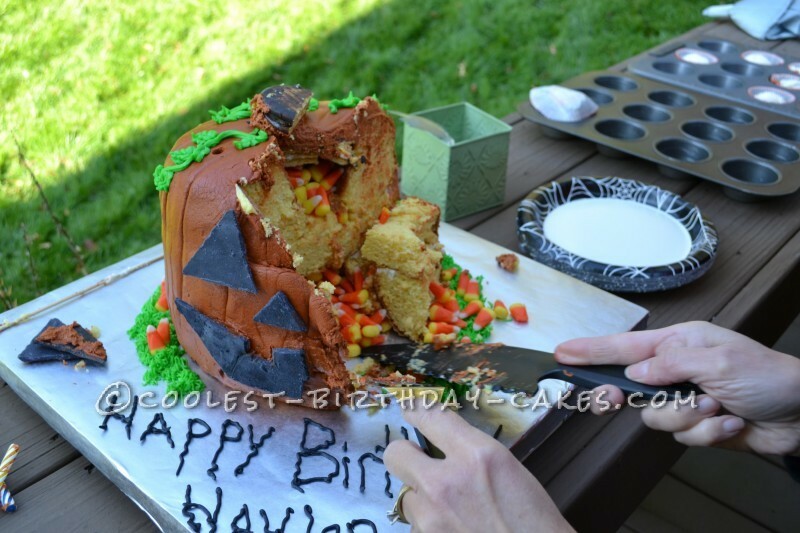 As a surprise for the birthday boy I added his favorite – candy corn inside the holes of the bundt cakes. After filling the holes with the candy corn I covered the holes with a piece of a Moonpie and it worked perfectly. I frosted the cake with butter cream frosting. I used the Wilton orange food coloring but then added a bit of royal blue to give it a more realistic pumpkin color. I think I put a tad too much blue in so this became the “yikes” part of the process. I eventually added a bunch of red and got it to a color I thought would work. I dirty-iced the cake then frosted it again. I used a Vanity paper towel to smooth it out. Then I used a knife to lightly run a line down the paper towel from the top of the cake to the bottom. I tried to make them about 1in or 1 1/2 in. apart around the pumpkin cake. These depressions helped give the pumpkins the indentations of a real pumpkin. Then I used melted almond bark (white chocolate) tinted with Wilton black food coloring and gently cut out triangles for eyes and a nose. 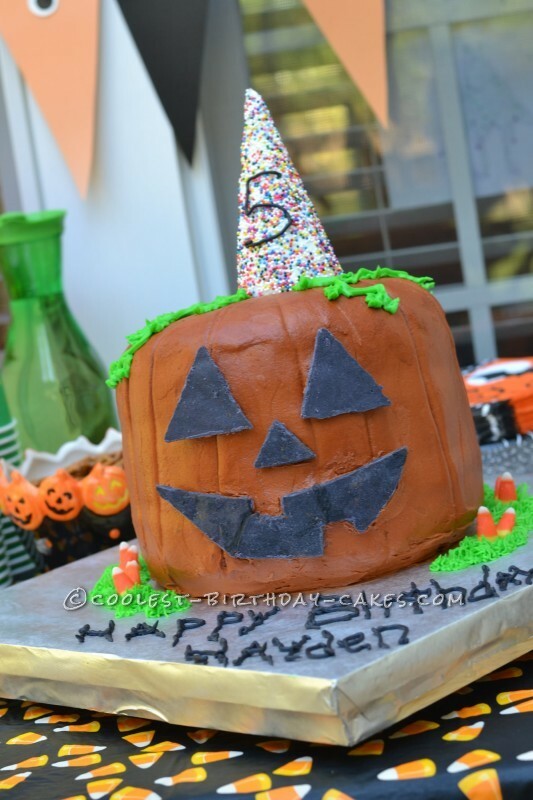 I also carved out a toothly smile but when attaching it to the cake needed to snap it into three pieces so it would attached flush with the cake –then I filled in the small cracks with black frosting. I “glued” all the chocolate pieces with some left over frosting. The top of the cake is a waffle ice cream cone dipped in melted almond bark and rolled in sprinkles. I prepared the chocolate pieces and birthday hat cone the night before frosting the cake. 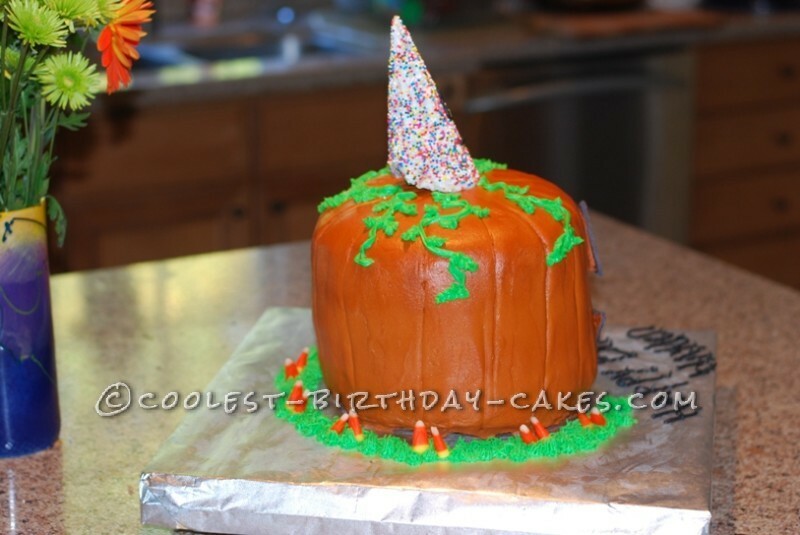 I then used the Wilton 233 tip to make grass around the base and added some candy corns as well. Then I used Wilton tip 104 to create some vines and leaves off the top of the pumpkin. I finished it off with Wilton tip 3 to write Happy Birthday. I just let the frosting squiggle out as it wanted to making for the spooky look to the writing. The cake was a huge hit! And oh boy, when the candy corn spilled out, wow! The kids went wild and were yelling how it was a “pinata cake”! 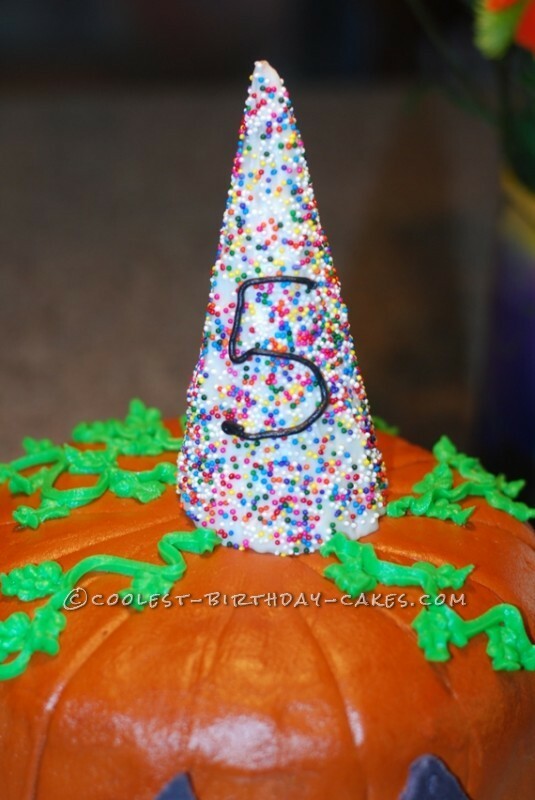 Then all the kids at the party had to have a few of the candy corns along with their piece of cake! Everyone said it tasted delicious and it fed 20 kids and many of their parents!